Up in the Air is a 2009 American comedy-drama film directed by Jason Reitman and written by Reitman and Sheldon Turner, based on the 2001 novel of the same name, written by Walter Kirn. The story is centered on corporate "downsizer" Ryan Bingham (George Clooney) and his travels. Vera Farmiga, Anna Kendrick, and Danny McBride also star. Filming was primarily in St. Louis, Missouri, which substituted for a number of other cities. Several scenes were filmed in Detroit, Omaha, Las Vegas and Miami. Reitman promoted Up in the Air with personal appearances at film festivals and other showings, starting with the Telluride Film Festival on September 5, 2009. The Los Angeles premiere was at the Mann Village Theater on November 30, 2009. Paramount scheduled a limited North American release on December 4, 2009, broadening the release on December 11, 2009, with a wide release on December 23, 2009. The National Board of Review and the Washington D.C. Area Film Critics Association named Up in the Air the Best Picture of 2009. It received eight Critics' Choice Movie Awards nominations and garnered a win for Adapted Screenplay, six Golden Globe Award nominations, earning a win for Best Screenplay, and three Screen Actors Guild nominations. It received six Academy Award nominations and recognition from numerous critics' associations. Ryan Bingham works for a human resources consultancy firm which specializes in termination assistance, and makes his living traveling to workplaces across the United States, conducting company layoffs and firings on behalf of employers. He also gives motivational speeches, using the analogy "What's in Your Backpack?" to extol the virtues of a life free of burdensome relationships with people as well as things. A frequent flyer, Ryan has no fixed abode, relishes his travels, and aspires to become the seventh and youngest person to earn ten million frequent flyer miles with American Airlines. During his travels, he meets another frequent flyer named Alex, and they begin a casual relationship. Ryan is called back to his company's offices in Omaha, Nebraska. Natalie Keener, a young and ambitious new hire, promotes a program designed to cut costs by conducting layoffs via videoconferencing. Ryan raises concerns that the program could be seen as detached and apathetic, arguing that Natalie knows nothing about the reality of the firing process or how to handle upset people. He then plays the role of a fired employee to demonstrate her inexperience. Ryan's boss assigns him to bring Natalie on his next round of terminations to show her the ropes. As they travel together, Natalie questions Ryan's philosophies on life, particularly on relationships and love, but Ryan is adamant that he is more than happy with his lifestyle. During the trip, Natalie is shattered when her boyfriend unceremoniously dumps her by text message, and Ryan and Alex try to comfort her. On the test run, the earlier concerns Ryan raised prove valid; one laid-off person breaks down in tears before the camera, and Natalie is unable to comfort him. Another threatens to commit suicide. Natalie later lectures Ryan about his refusal to consider a commitment to Alex in spite of their obvious compatibility, and becomes infuriated; she apologizes later, but soon afterward they are both ordered back to Omaha to implement Natalie's program. Instead of returning immediately to Omaha, Ryan convinces Alex to accompany him to his younger sister's wedding. He learns that the reason the couple had him take photos of a cutout picture of them in various places was because they cannot afford a honeymoon. When the groom gets cold feet, Ryan's older sister talks Ryan into using his motivational skills to persuade the groom to go through with the wedding. Although this runs counter to Ryan's personal philosophy, he successfully argues that the important moments in life are rarely unshared. The wedding proceeds without any further hitches. Ryan begins having second thoughts about his life and philosophies. As he starts delivering his "What's in Your Backpack?" speech at a convention in Las Vegas, he realizes he no longer believes it, and walks off the stage. On an impulse, he flies to Alex's home in Chicago. When she opens the door, Ryan is stunned to discover she is married and has children, and leaves before her husband can suspect anything. She later tells him over the phone that her family is her real life and he is an escape. On Ryan's flight home, the crew announces that he has just crossed the ten million mile mark, and a small celebration is thrown. The airline's chief pilot comes out of the cockpit to meet Ryan. He notes that Ryan is the youngest person to reach the milestone. When asked where he is from, a disheartened Ryan can only respond, "here." Ryan calls the airline to transfer five hundred thousand miles each to his sister and brother-in-law, enough for them to fly around the world for their honeymoon. His boss tells Ryan that a woman he and Natalie fired during their travels has killed herself, and that an upset Natalie has quit via text message. The company also puts the remote-layoff program on hold. Natalie applies for a job in San Francisco, where she was offered a job before following her now ex-boyfriend to Omaha. The interviewer is impressed by her qualifications and a glowing recommendation from Ryan, and hires her. The film concludes with Ryan standing in front of a vast destination board, looking up, and letting go of his luggage. George Clooney as Ryan Bingham, "a suave, smartly dressed businessman in his 40s"
The film has a thematic connection to the children's book The Velveteen Rabbit, which appears in the film, before the wedding. In one sense, it's a movie about a man who fires people for a living. In another sense, it's a movie about a man who collects air miles excessively. In another sense, it's about a man who meets a woman who's so similar to him that even though they both believe in the idea of living solo, they begin to fall in love. Reitman also later stated that "the movie is about the examination of a philosophy. What if you decided to live hub to hub, with nothing, with nobody?". Walter Kirn wrote Up in the Air, the book on which the film is based, during a snowbound winter on a ranch in rural Montana, while thinking about airports, airplanes and first-class passengers he had met who would strongly resemble Ryan Bingham. The novel was published in 2001 and, shortly after, Sheldon Turner discovered the book and wrote a screenplay adaptation, which he sold to DreamWorks in 2003. Canadian-American filmmaker Jason Reitman later came upon the novel (initially attracted by the Christopher Buckley blurb on the cover) while browsing in the Los Angeles bookstore Book Soup. Reitman persuaded his father, Canadian-American filmmaker Ivan Reitman, to purchase the book's film rights, and the elder Reitman commissioned a screenplay from Ted Griffin and Nicholas Griffin, who used some elements from Turner's script in their work. Jason Reitman then developed his own screenplay, incorporating some of the original script that was (unbeknownst to Reitman) written by Turner. Some Turner inventions that were used in the film include Ryan's boilerplate termination speech ("Anyone who ever built an empire or changed the world sat where you're sitting right now ..."), a key plot point involving a suicide, and the character of Ryan's partner (written by Turner as male). Reitman initially attempted to claim sole credit for writing the film, then later admitted to confusion when the Writers Guild of America ruled that he should share credit with Turner, whose script Reitman claimed to have never read. He and Turner later appeared at a WGA event where both said they were happy to share credit, after Turner's contribution to the final product was made clear. At a press screening, Reitman also said that his father Ivan had written "the best line in the movie." Though Reitman has claimed in countless interviews that he wrote the parts specifically for George Clooney, Vera Farmiga, Anna Kendrick, Jason Bateman, Danny McBride, Melanie Lynskey, Amy Morton, Sam Elliott and Zach Galifianakis, some of the actors publicly stated their confusion in Reitman's assertion, if only because they knew he was meeting with other actors all along including his choice to fill his last lead role with Ellen Page (who starred in Reitman's previous film Juno) for the part that Kendrick ultimately played. On the part played by Farmiga, he cited her ability to walk a fine line between aggressiveness and femininity. On Kendrick, Reitman cited that he was inspired by her performance in Rocket Science. On Clooney, he said, "If you're going to make a movie about a guy who fires people for a living and you still want to like him, that actor better be damn charming and I don't think there's a more charming actor alive than George Clooney. I was very lucky he said yes." Reitman said, on the B.S. Report with Bill Simmons, that he considered Steve Martin for the part if Clooney declined the role. Reitman said that he would have changed the movie with Martin and given Martin "his Lost in Translation." Approximately 4,600 people applied to be extras in the film during the open call on January 24, 2009 and January 25, 2009, at Crestwood Court in St. Louis, Missouri. Up in the Air cast 2,000 extras with 15 to 25 Missouri actors in minor speaking roles. About 250 extras were used from the Omaha, Nebraska, area. They were used for filming inside and outside the terminal at Eppley Airfield, while Clooney acted out most of his scenes inside the terminal. While filming in St. Louis and Detroit, Reitman placed an ad in the paper asking if people who recently lost their job wanted to be in a documentary about job loss. He specified "documentary" in the ad so that actors would not respond. Reitman was amazed by how many people of different age, race, and gender were willing to speak frankly about what happened and what a cathartic experience it had been. The film crew received a startling 100 responses, including 60 people filmed (30 in Detroit and 30 in St. Louis). Twenty-two are seen in the film. The interviews ran for about ten minutes on what it is like to lose their job in this poor economy, and after that they would "fire" them on camera and ask them to either respond the way they did the day they lost their job or, if they preferred, the way they wished they had responded. Filming was mostly done in the St. Louis area. Several scenes were filmed at the Berry and McNamara Terminals at Detroit Metro Airport in late February 2009 with minimal filming in Omaha, in Las Vegas and in Miami, Florida. Missouri and St. Louis leaders provided $4.1 million in tax credits for the $25 million film. Producers set up a St. Louis production office on January 5, 2009. Filming began in St. Louis on March 3, 2009, and continued through the end of April. The film includes 80 different sets at 50 locations throughout the St. Louis area, including St. Louis Lambert International Airport Concourse C and Concourse D (which played the part of several airports across America), the Mansion House apartments in downtown St. Louis, Hilton St. Louis at the Ballpark, Hilton St. Louis Airport, DHR International building (8000 Maryland Ave.), the Cheshire Inn, the GenAmerica building (700 Market), Renaissance Grand Hotel, Maplewood United Methodist Church, and Affton High School. The film was shot at Lambert-St. Louis International Airport for five days, twenty hours each day. In October 2008, Production Services of Omaha scouted locations in Omaha, Nebraska for three days of filming in late April with Clooney. Some of the scenes were shot inside the Visitor's Bureau and in a condo in the Old Market area of downtown Omaha and at the south end of the main terminal at Eppley Airfield. Reitman needed fifty days to film Up in the Air, eight of which were devoted to aerial shooting. The aerial shots turned out to be more difficult than expected. He was unable to use three days of the aerial filming. Many aerial shots, such as the crop circle on fire, are seen in the Paramount trailer, but are not used in the film. The pilot who flies the Boeing 747 that carried the space shuttle flew the aircraft for the aerial shots. The film features heavy product placement, with American Airlines, Chrysler, Hertz, Travelpro, and Hilton Hotels all featured prominently. Competing brands are displayed as blurs in scene backgrounds or are replaced with pseudonyms in dialogue. However, the brands did not pay for the exposure; rather, they waived the fees for the producers to shoot on location, such as at AA's airport areas and inside Hilton hotels. Reitman expressed his desire to use actual brands as he finds them less distracting. 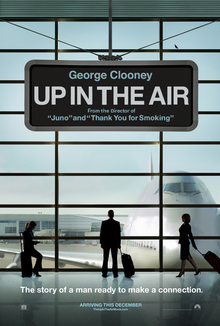 The post-production schedule for Up in the Air was shorter than Jason Reitman's previous two films. The editing team had only 16 to 17 weeks post-schedule, whereas an editing deadline is usually from 22 to 26 weeks. Reitman was involved in post-production while shooting. The film was shot entirely on location and Glauberman stayed in Los Angeles to cut. She would send him scenes every day or every other day as she finished them, and he would view them. He flew home every weekend to work with her for a few hours on Saturday or Sunday in order to stay on schedule. Editing helped determine how nonverbal moments shape the first meeting between Ryan and Alex, who become lovers. "In a scene like that, there is a sort of playfulness that goes on," editor, Dana E. Glauberman said. "There were little looks that they gave each other. Sometimes I stayed a beat longer on a take to get that little sparkle in their eyes ... You can see a lot of playfulness in the quick cuts back and forth when they are teasing each other, but then there are also certain moments that Vera would give a little raise of an eyebrow, or George would give the same thing. Those tiny nuances are really helpful to show their character and show what they are after." Up in the Air: Music from the Motion Picture is the official soundtrack to the film, released by Warner Music on November 9, 2009, and composed by Rolfe Kent, who recorded his score with a 55-piece ensemble of the Hollywood Studio Symphony at the Sony Scoring Stage. It was orchestrated by Tony Blondal. Kevin Renick wrote the song "Up in the Air" two years prior to knowing that Reitman was working on a film adaptation to the book. He had been laid off at the time, and was an unrecorded, unemployed St. Louis musician. When Renick researched the film he discovered that the theme of the film was much the same as the song he had written. "The song is about uncertainty, disconnection and loneliness, while alluding to career transition," Renick explained. "It's a melancholy song, and a narrative about finding out where your life's going to go." He handed a cassette to Reitman after the director did an interview at Webster University. Renick included a spoken-word introduction about the song on the cassette so that Reitman would know why he was given the song. Reitman found a tape deck, listened, liked the song and placed the original introduction and song from the cassette midway through the credits. Reitman stated that the song has a do-it-yourself authenticity. Anna Kendrick at the 2009 Toronto International Film Festival for a panel on the film. Reitman heavily promoted Up in the Air with personal appearances at film festivals and other showings. He stated that he could relate to and enjoys the idea of Ryan Bingham's lifestyle. "Yesterday [October 28, 2009] I took my 10th flight in 10 days so I live that life myself and I kinda enjoy it," Reitman said, "I think when you're in an airplane it's the last refuge for the people who enjoy being alone and reading a book." Reitman documented his experiences promoting the film. He took photos of everyone who interviewed him and recorded videos in every city he visited. He edited these images into a short video titled Lost In The Air: The Jason Reitman Press Tour Simulator. Up in the Air was screened as a "sneak preview" at the Telluride Film Festival on September 6, 2009, before its world premiere at the Toronto International Film Festival (TIFF) on September 12. The film was initially not scheduled to be completed for another three months, but Reitman rushed production in order to maintain a streak of debuting his films at TIFF. During October and November 2009, Up in the Air screened at festivals including the Aspen Filmfest, the Woodstock Film Festival, the Hamptons International Film Festival, the Mill Valley Film Festival, the Austin Film Festival, the London Film Festival, the St. Louis International Film Festival, the Starz Denver Film Festival, and the Stockholm International Film Festival. It was the only American film to compete for the Golden Marc'Aurelio Audience Award for Best Film at the International Rome Film Festival. On November 6, The New York Times film critic Janet Maslin interviewed Reitman and Kirn at the Jacob Burns Film Center following a screening of the film. Following the positive response the film received at the Telluride Film Festival, Paramount intended to move Up in the Air from its original release date of December 4, 2009, planning for a November 13 limited release going wide before the Thanksgiving holiday. However, this schedule conflicted with the release of The Men Who Stare at Goats, another Clooney film. The film was eventually released on December 4 in fifteen theaters spanning twelve markets, broadening in the next week to 72 theaters and going into wide release on December 23, 2009. It was released in other countries beginning in early 2010. Up in the Air was shown at a sneak preview on September 5, 2009 and September 6, 2009 at the Telluride Film Festival. Reitman had fueled speculation that he would give a sneak preview at that festival. He posted pictures from Telluride on his Twitter account. Prior to the first showing, people waited two hours to get into Up in the Air and hundreds were turned away. The world premiere for Up in the Air occurred at 2009's Toronto International Film Festival (TIFF) which ran from September 10 to 19, 2009. The press showing was on Friday September 11, 2009. Public screenings were on September 12, 13, and 19. Reitman originally did not plan to debut the film at TIFF, since it was not scheduled to be ready for another three months. He rushed production to keep his Toronto debut streak going. The first clip of the film debuted on Apple Inc. website on September 8, 2009. The first trailer was available on iTunes on September 10, 2009 and on September 18, 2009, it screened before the new movies The Informant! and Love Happens. The second trailer became available on October 1, 2009. Reitman received Aspen Film's first New Directions Award and participated in a question and answer session following a screening of Up in the Air on Friday October 2, 2009 at the Wheeler Opera House. The Aspen Film Festival ran from September 30, 2009 through October 4, 2009. It was shown twice at the Tinker Street Cinema on the closing day of the Tenth Annual Woodstock Film Festival 2009 on October 4, 2009. Vera Farmiga and Lucy Liu participated in a question and answer session moderated by entertainment journalist Martha Frankel after the film and in the Sunday noontime WFF Actor's Dialogue panel. The 2009 Hamptons International Film Festival showed Up in the Air on October 10, 2009 during its run at Long Island, New York's east end from October 8 to October 12, 2009. The Spotlight Tribute held during the 32nd edition of Mill Valley Film Festival hosted an interview with Reitman and a screening of Up in the Air on Wednesday October 14, 2009 in the Smith Rafael Film Center, San Rafael, California. The Mill Valley Film Festival ran from October 8 to October 18, 2009. It was also shown four times at the 53rd London Film Festival which was held from October 14–19, 2009. Up in the Air was the only American film to compete for the Golden Marc'Aurelio Audience Award for Best Film at the fourth annual International Rome Film Festival which ran from October 15 through October 23, 2009. It was shown three times from October 17 to October 19, 2009. Reitman showed Up in the Air at ShowEast in Orlando, Florida on October 26 and October 27, 2009, and asked for the movie theater owners and managers to support the picture as fervently as they did his film Juno two years earlier. Reitman also held a Q&A and pep talk with film students at the University of Central Florida. The first St. Louis press screening happened on October 28, 2009 at the Tivoli Theater. Up in the Air closed the Austin Film Festival on October 29, 2009 at the Paramount. Reitman attended the screening. The Austin Film Festival ran from October 22 to October 29, 2009. The Palm Springs International Film Society showed Up in the Air on Thursday, October 29, 2009 at the Regal Cinema in Palm Springs, California. Anna Kendrick was present at the showing. Vera Farmiga and Anna Kendrick hosted a screening of Up in the Air at the Paris Theatre, New York City, New York on Thursday November 5, 2009. On November 6, 2009, the New York City Apple Store in SoHo hosted a conversation with director Jason Reitman. On November 6, 2009 The New York Times critic Janet Maslin interviewed Reitman and Kirn during a Q&A session held at the Jacob Burns Film Center after a screening of Up in the Air. The question and answer session was followed by a reception in the Jane Peck Gallery. The Boston Sunday Night Film Club had a free screening on Sunday November 8, 2009, with a Q&A session with Reitman following the screening. Up in the Air was the centerpiece for the 18th Annual St. Louis International Film Festival, which was held from November 12 to November 22, 2009. The film was shown November 14, 2009 at the Tivoli Theater in University City, Missouri with Jason Reitman and Michael Beugg in attendance. Kevin Renick, the St. Louis musician who wrote the song Up in the Air, performed half an hour prior to the screening. Yukon Jake, who performed in the wedding scene in Up in the Air, provided entertainment during the party prior to the screening. The party took place at the St. Louis Ballpark Hilton and the Airport Hilton. Both are featured in the film. On November 14, 2009, Paramount flew 50 members of the press to New York with Anna Kendrick, Sad Brad Smith and representatives of American Airlines to promote Up in the Air. The film was shown on the aircraft's video monitors during the flight from New York to Los Angeles. American Airlines provided the Boeing 767 gratis. Smith performed a few songs including Help Yourself in the aisle of the aircraft. On November 18, 2009, Backstage and Paramount Pictures had a special screening of Up in the Air for Screen Actors Guild and Backstage members at The Paramount Theatre (on the Paramount Lot), Los Angeles, California. The screening of the film was followed by a conversation with cast members Vera Farmiga and Anna Kendrick. The Starz Denver Film Festival closed on November 22, 2009 with a screening of Up in the Air, with an introduction by J.K. Simmons, who was in town to accept the festival's Cassavetes Award earlier that afternoon. The 20th Stockholm International Film Festival, which ran from November 18 to November 29, 2009, closed with a screening of Up in the Air on November 29, 2009. The film was released in both DVD and Blu-ray Disc formats on March 9, 2010, and sold 536,441 units in its first week of release, worth $9,114,133 of consumer spending. To date the film has sold 1,162,509 home copies, equivalent to $18,517,122 of sales. Up in the Air was released in 15 theaters in the U.S. on December 4, 2009 and ranked number 13. It took in $1,181,450, with an average of $78,763 per theater. After three days it expanded to 72 theaters and took in $2,394,344 ($33,255 per theater), during the second weekend. During its third weekend, it broke into the top 10 as it widened to 175 theaters ahead of its nationwide expansion on December 23, 2009. It came in at number 8 with $3,210,132–$18,344 per theater. The film expanded to 1,895 theaters on December 23. It completed its domestic run on April 8, 2010, with a total domestic gross of $83,823,381 and a foreign total of $83,019,358 for a worldwide gross of $166,842,739. George Clooney's performance was critically lauded. Up in the Air received critical acclaim, with Clooney's performance receiving widespread praise, as well as Kendrick and Farmiga. Review aggregator Rotten Tomatoes gave the film an approval rating of 91% based on 269 reviews, with a rating average of 8.1/10. The site's critical consensus reads, "Led by charismatic performances by its three leads, director Jason Reitman delivers a smart blend of humor and emotion with just enough edge for mainstream audiences." On Metacritic, the film has a rating score of 83 out of 100, based on 36 critics, indicating "universal acclaim". The sneak preview of Up in the Air was the highest profile hit during the Telluride film festival. The film also tied for third place in the Toronto International Film Festival Indiewire poll. Kenneth Turan of the Los Angeles Times wrote, "Up in the Air makes it look easy. Not just in its casual and apparently effortless excellence, but in its ability to blend entertainment and insight, comedy and poignancy, even drama and reality, things that are difficult by themselves but a whole lot harder in combination. This film does all that and never seems to break a sweat." Entertainment Weekly's Owen Gleiberman agreed, rating the film an A as a "rare and sparkling gem of a movie, directed by Jason Reitman with the polish of a master." Claudia Puig of USA Today praised the film's sense of timeliness, writing, "It's tough to capture an era while it's still happening, yet Up in the Air does so brilliantly, with wit and humanity ... Reitman emerges as a modern-day Frank Capra, capturing the nation's anxieties and culture of resilience." Stephen Saito of IFC.com wrote, "It touches on larger themes of mass unemployment, cultural alienation and technology as a crutch. But ultimately, it's really an expertly done character study that's a dramatic change of pace from director Jason Reitman's previous two films." Jonathan Romney of The Independent wrote, "Its cynical wit almost places it in the Billy Wilder bracket: Up In The Air is as eloquent about today's executive culture as The Apartment was about that of 1960. It is a brutal, desolate film – but also a superb existential rom-com, and the most entertaining lesson in contemporary socio-economics that you could hope for." Roger Ebert gave the film four stars and wrote, "This isn't a comedy. If it were, it would be hard to laugh in these last days of 2009. Nor is it a tragedy. It's an observant look at how a man does a job." Calling the film "a slickly engaging piece of lightweight existentialism," Todd McCarthy wrote in Variety that "Clooney owns his role in the way first-rate film stars can, so infusing the character with his own persona that everything he does seems natural and right. The timing in the Clooney-Farmiga scenes is like splendid tennis." The New York Times' Manohla Dargis especially appreciated the film's strong female roles, noting that "the ferocious Ms. Kendrick, her ponytail swinging like an ax, grabs every scene she's in," but wrote that the film "is an assertively, and unapologetically, tidy package, from its use of romance to instill some drama ... and the mope rock tunes that Mr. Reitman needlessly overuses." The Chicago Tribune's Michael Phillips wrote, "Up in the Air is a slickly crafted disappointment. [It] feels tailor-made for George Clooney, who is very good. But the stakes remain frustratingly low and it's one of those contemporary middlebrow projects that asks us to root for a genial, shallow individual as he learns to be a little less the man he was." Julian Sancton of Vanity Fair wrote, "There are two movies in Up in the Air: one about a guy who's flying around the country firing people, and one about a commitment-phobe who's flying away from responsibility and a shot at true love, as embodied by Farmiga. There is no attempt to braid these two threads together, and that's where the movie feels unsatisfying." J. Hoberman of The Village Voice wrote, "Like Juno, Up in the Air conjures a troubling reality and then wishes it away. The filmmakers have peeked into the abyss and averted their eyes ... [the film] warns that you can't go home again – and then, full of false cheer and false consciousness, pretends you can." Shave Magazine's Jake Tomlinson gave the film four out of five stars and wrote, "There is a very strong sense of humor as well as emotional depth, yet the scope of the film sometimes limits these sentiments. As a moviegoer, this film provides a satisfying experience where one can take a step back to ponder some of the finer points in our daily lives, but don't expect to find all the answers here." Up in the Air earned various awards and nominations, in categories ranging from recognition of the film itself to its screenplay, direction and editing, to the performance of the three primary actors – George Clooney, Vera Farmiga, and Anna Kendrick. The film received six Academy Award nominations and Farmiga and Kendrick both received nominations for Best Supporting Actress, although the film failed to win any of the awards. At the 63rd British Academy Film Awards, Up in the Air won one award – Best Adapted Screenplay, awarded to Reitman and Turner – out of the five for which it was nominated. The Dallas-Fort Worth Film Critics Association named Up in the Air Best Picture and awarded Reitman Best Director and Best Screenplay with Turner, and Clooney was given the award for Best Actor. The film also received five nominations at the 67th Golden Globe Awards, with Reitman and Turner taking the award for Best Screenplay. Reitman and Turner also received recognition for the film's screenplay from the Writers Guild of America, where they won the Best Adapted Screenplay award. 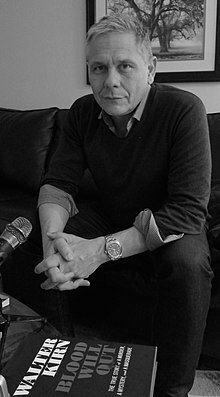 The film garnered five nominations from the Satellite Awards, with Rolfe Kent, the film's score composer, winning the Best Original Score award. Clooney, Farmiga and Kendrick were each nominated for an award at the 16th Screen Actors Guild Awards, but ultimately lost out. Kendrick earned an MTV Movie Award for Best Breakthrough Performance and the Rising Star Award from Palm Springs International Film Festival for her role in the film. Up in the Air won Best Film from eleven awards ceremonies, including the Florida Film Critics Circle, Iowa Film Critics, Southeastern Film Critics, and Vancouver Film Critics Circle. The film earned four nominations for the Best Cast from the Broadcast Film Critics Association, Central Ohio Film Critics, Denver Film Critics Society, and the Washington D.C. Area Film Critics Association. At the Kansas City Film Critics Circle and the National Board of Review, Up in the Air won each of the awards for which it was nominated. Costume Designer Danny Glicker was nominated for his work by the Costume Designers Guild in the Contemporary Film category. In addition, the film was included on lists of the ten best films of 2009 by Roger Ebert, the American Film Institute, and The New York Times. ^ "Executive Suite: Tom Pollock and Ivan Reitman". The Hollywood Reporter. 2011-10-03. Archived from the original on 2014-03-14. Retrieved 2014-01-25. ^ Abramowitz, Rachel (November 29, 2009). "Jason Reitman firmly at the controls in 'Up in the Air'". Los Angeles Times. Archived from the original on 2009-12-02. Retrieved November 29, 2009. ^ Schuker, Lauren A.E. (November 27, 2009). "Director Jason Reitman on 'Up in the Air'". The Wall Street Journal. Archived from the original on 2014-12-25. Retrieved November 29, 2009. ^ a b "Up in the Air (2009) Box Office". Box Office Mojo. Archived from the original on 2011-08-14. Retrieved August 6, 2010. ^ "Up in the Air: Credits". Paramount. Archived from the original on December 25, 2009. Retrieved September 5, 2009. ^ a b French, Philip (January 17, 2010). "Up in the Air". The Guardian. London: Guardian Media Group. Archived from the original on 2014-12-25. Retrieved August 1, 2010. ^ "Up in the Air Full Cast". imdb.com. 2017. Archived from the original on 2016-11-28. Retrieved May 17, 2017. ^ Harper, J. M. (December 28, 2009). "The Velveteen Man". Wunderkammer Magazine. Archived from the original on 2010-01-23. Retrieved March 29, 2010. ^ Karger, Dave (September 9, 2009). "Toronto preview: All eyes on 'Up in the Air'". Entertainment Weekly. Archived from the original on 2009-09-12. Retrieved September 9, 2009. ^ Schuker, Lauren A. E. (September 3, 2009). "Hollywood Hits the Books: Mr. Fox, Sherlock Holmes and a crew of wild things leap to the screen". The Wall Street Journal. Archived from the original on 2014-12-25. Retrieved September 4, 2009. ^ a b Nemiroff, Perri (November 5, 2009). "Interview: Up In The Air's Jason Reitman, Vera Farmiga, Anna Kendrick and Walter Kirn". Cinema Blend. Archived from the original on 2010-02-25. Retrieved November 7, 2009. ^ Pond, Steve (January 25, 2010). "'Up in the Air' Holds a Damage-Control Screening". The Wrap. Archived from the original on 2010-09-30. Retrieved August 3, 2010. ^ D'Alessandro, Anthony (December 9, 2009). "Reitman on origins of 'Air'". Variety. Retrieved December 9, 2009. ^ a b c Pond, Steve (January 25, 2010). "'Up in the Air' Holds a Damage-Control Screening". The Wrap. Archived from the original on 2010-01-29. Retrieved January 29, 2010. ^ a b Zeitchik, Steven (January 15, 2010). "Screenwriting credits, floating up in the air". Los Angeles Times. Archived from the original on 2010-01-19. Retrieved January 16, 2010. ^ Olsen, Mark (September 12, 2009). "Smooth Landing: "Up In The Air"". Los Angeles Times. Archived from the original on 2009-09-25. Retrieved September 13, 2009. ^ a b Sciretta, Peter (September 16, 2009). "Must Watch Interview: Up in the Air's Jason Reitman on the Telluride Gondola". /Film. Archived from the original on February 2, 2013. Retrieved September 27, 2009. ^ a b Billington, Alex (September 16, 2009). "Interview: Up in the Air's Jason Reitman on the Telluride Gondola". First Showing. Archived from the original on 2009-09-22. Retrieved September 27, 2009. ^ Buchanan, Kyle (January 18, 2010). "The Jason Reitman Takedown Begins". Movieline. Archived from the original on 2010-01-21. Retrieved January 18, 2010. ^ Elfman, Mali (October 21, 2009). "LFF: Up in the Air Press Conference – Reitman, Farmiga, Kendrick". Screen Crave. Archived from the original on January 13, 2010. Retrieved November 1, 2009. ^ Anderton, Ethan (January 23, 2010). "Jason Reitman Talks More New Projects & Clooney-Less UITA". First Showing. Archived from the original on 2010-01-26. Retrieved February 6, 2010. ^ a b "Official information for the St. Louis film "Up in the Air"". Missouri Film Commission Project Hotline. January 15, 2009. Archived from the original on May 10, 2008. Retrieved January 18, 2009. ^ a b "Clooney's 'Up in the Air' Filming in St. Louis". KPLR. Archived from the original on 2011-07-13. Retrieved September 4, 2009. ^ a b McIntire, Ann (April 28, 2009). "George Clooney Filming In Omaha: Eppley Airfield transformed into movie set". WOWT. Archived from the original on 2011-09-27. Retrieved September 4, 2009. ^ McCollum, Charlie (December 3, 2009). "Jason Reitman flies high with 'Up In the Air'". San Jose Mercury News. Archived from the original on 2011-06-29. Retrieved December 6, 2009. ^ Roberts, Sheila (November 27, 2009). "Jason Reitman Interview, Up in the Air". Movies on Line. Archived from the original on 2009-11-29. Retrieved November 29, 2009. ^ "Up in the Air End Title Credits" (PDF). Paramount. Archived from the original (PDF) on February 15, 2010. Retrieved December 11, 2009. ^ Zeitchik, Steven (September 12, 2009). "'Up in the Air's' recession-themed flight plan". The Hollywood Reporter. Archived from the original on 2013-01-05. Retrieved September 13, 2009. ^ Kaufman, Anthony (September 13, 2009). "Toronto Film Festival: George Clooney's "Up In the Air" Spotlights Economic Trouble". The Wall Street Journal. Archived from the original on 2009-09-15. Retrieved September 13, 2009. ^ Smith, Alicia (March 5, 2009). "George Clooney Filming at Metro Airport". WXYZ-TV. Archived from the original on 2009-03-01. Retrieved November 1, 2009. ^ Billington, Alex (November 24, 2008). "Vera Farmiga Also Joins Jason Reitman's Up in the Air". First Showing. Archived from the original on 2009-11-21. Retrieved November 11, 2009. ^ Abravanel, Lesley (April 30, 2009). "George Clooney @ Delano". The Miami Herald. Archived from the original on 2010-03-10. Retrieved October 30, 2009. ^ Logan, Tim (November 28, 2010). "Movie to create 500 jobs, $50 million for St. Louis". St. Louis Business Journal. Archived from the original on 2010-11-29. Retrieved November 28, 2010. ^ a b Volkmann, Kelsey (January 2, 2009). "Movie to create 500 jobs, $50 million for St. Louis". St. Louis Business Journal. Retrieved September 26, 2009. ^ "St. Louis Airport Commission Meeting" (PDF). St. Louis Airport Commission. May 6, 2009. Archived from the original (PDF) on December 4, 2010. Retrieved September 4, 2009. ^ "St. Louis Hotel Guide". St. Louis Hotel Guide. Moore Design Group. Archived from the original on 2009-08-03. Retrieved September 4, 2009. ^ Williams, Joe (December 11, 2009). "Clooney was here: St. Louis locations in 'Up in the Air'". St. Louis Post-Dispatch. Archived from the original on December 30, 2009. Retrieved December 11, 2009. ^ Smith, Erika (September 20, 2010). "About Lambert-St. Louis International Airport". St. Louis International Dispatch. Archived from the original on 2011-07-18. Retrieved July 21, 2011. ^ Fischbach, Bob (March 28, 2010). "Omaha gets more exposure on 'Up in the Air' DVD". Omaha World-Herald. Archived from the original on June 16, 2011. Retrieved April 3, 2010. ^ "Actor George Clooney coming to Omaha". KHAS-TV. January 29, 2009. Archived from the original on 2016-01-28. Retrieved February 3, 2009. ^ ""Up In the Air" Looking for Extras". Nebraska Independent Film Projects. March 31, 2009. Archived from the original on October 28, 2009. Retrieved November 8, 2009. ^ Kelley, Matt (February 7, 2009). "Actor George Clooney to make a film in Omaha-Council Bluffs". Radio Iowa News. Archived from the original on 2011-09-29. Retrieved July 28, 2011. ^ a b Clifford, Stephanie (April 4, 2010). "Before the Actors, Filmmakers Cast Products". The New York Times. Archived from the original on 2010-04-08. Retrieved April 4, 2010. ^ Hampp, Andrew (December 14, 2009). "How American Airlines Got a Free Ride in 'Up in the Air': Airline, Hilton Hotels Trade Production Savings for Product Integrations in George Clooney's Latest Movie". Advertising Age. Archived from the original on 2009-12-16. Retrieved December 14, 2009. ^ Hoad, Phil (January 7, 2010). "Know your film product placement: A vanguard of brands on the frontline of product placement are exposing themselves to negative associations". The Guardian. London. Archived from the original on 2014-08-09. Retrieved January 8, 2010. ^ a b Newman, Andrew Adam (December 20, 2009). "A Dream for an Airline and a Hotel Chain". The New York Times. Archived from the original on 2011-10-29. Retrieved June 1, 2010. ^ Vanairsdale, S.T. (November 4, 2009). "Meet Dana E. Glauberman, Jason Reitman's Editor Extraordinaire". Movieline. Archived from the original on 2010-03-11. Retrieved November 4, 2009. ^ Giardina, Carolyn (December 10, 2009). "Hidden key to thesps' success: editors". Variety. Retrieved December 11, 2009. ^ "Up In the Air (Music from the Motion Picture)". iTunes. Archived from the original on 2010-08-27. Retrieved August 2, 2010. ^ Goldwasser, Dan (October 23, 2009). "Rolfe Kent scores Up in the Air". ScoringSessions.com. Archived from the original on 2010-04-01. Retrieved October 23, 2009. ^ Wichern, Amanda (December 4, 2009). ""Up In The Air": A dream came true for Kirkwood High grad Kevin Renick when his song was featured in new George Clooney movie". Webster-Kirkwood Times. Archived from the original on 2014-12-25. Retrieved December 6, 2009. ^ Pond, Steve (October 7, 2009). "'Up in the Air' Sounds Great, Too". The Wrap. Archived from the original on 2009-10-11. Retrieved October 30, 2009. ^ Whitlock, Cordell; Bush, Mike (November 9, 2009). "St. Louisan pens title track for locally filmed "Up In The Air"". KSDK. Retrieved November 9, 2009. ^ Held, Kevin (December 11, 2009). "Kevin Renick delighted to hear his song in "Up In The Air" credits". KSDK. Retrieved December 12, 2009. ^ a b c Diaz, Victor (October 29, 2009). "Clooney's newest movie closes Austin Film Festival". News 8 Austin. Retrieved October 29, 2009. ^ Sciretta, Peter (January 7, 2010). "VOTD: Lost In The Air: The Jason Reitman Press Tour Simulator". /Film. Archived from the original on 2010-01-14. Retrieved January 8, 2010. ^ Willman, Chris (September 6, 2009). "Clooney's "Up in the Air" Premieres at Telluride". The Huffington Post. Archived from the original on 2009-09-16. Retrieved December 31, 2009. ^ Horn, John (September 5, 2009). "Telluride Film Festival: Jason Reitman returns flying high". Los Angeles Times. Archived from the original on 2009-10-06. Retrieved December 31, 2009. ^ a b Hernandez, Eugene (September 3, 2009). "Celebrating Cinema as an Art, Telluride Unveils '09 Fest". Indiewire. Archived from the original on 2009-09-05. Retrieved September 5, 2009. ^ Wloszczyna, Susan (September 11, 2009). "The 'Juno' midwives return to Toronto with new films". USA Today. Archived from the original on 2010-05-31. Retrieved December 31, 2009. ^ Zeitchik, Steven (September 3, 2009). "With 'Up in the Air,' Jason Reitman tries another fall take-off". The Hollywood Reporter. Archived from the original on January 5, 2013. Retrieved September 3, 2009. ^ a b Malcolm, Timothy (September 23, 2009). "Clooney movie 'Up in the Air' to close Woodstock Film Festival". Times-Herald Record. Archived from the original on 2011-06-17. Retrieved September 23, 2009. ^ a b Gaita, Paul (September 29, 2009). "'Air,' Nair added to Hamptons Film Festival". Los Angeles Times. Archived from the original on 2010-02-06. Retrieved September 29, 2009. ^ a b Hebron, Sandra. "Up in the Air". The Times BFI 53rd London Film Festival 14–29 October 2009. London Film Festival. Archived from the original on 14 September 2009. Retrieved September 9, 2009. ^ a b Fees, Alex (November 14, 2009). "'Up In the Air' debuts in University City". KSDK. Retrieved November 14, 2009. ^ a b Roberts, Michael (November 23, 2009). "Denver Film Festival closes with weak surprise, strong film: George Clooney's Up in the Air". West Word. Archived from the original on 2010-05-17. Retrieved November 23, 2009. ^ a b Roxborough, Scott (October 21, 2009). "Stockholm fest sets lineup: Nov. event will open with 'Precious,' close with 'Up in the Air'". The Hollywood Reporter. Archived from the original on January 25, 2013. Retrieved October 30, 2009. ^ a b Vivarelli, Nick (September 25, 2009). "'Up in the Air' tops Rome lineup". Variety. Retrieved September 26, 2009. ^ a b "Up in the Air". Jacob Burns Film Center. Archived from the original on 2011-07-25. Retrieved October 31, 2009. ^ Fernandez, Jay A. (August 21, 2009). ""Shutter Island" release postponed to February". Reuters. Archived from the original on 2009-08-24. Retrieved August 22, 2009. ^ Sciretta, Peter (September 10, 2009). "Up in The Air Gets Early Release". /Film. Archived from the original on 2009-09-13. Retrieved September 10, 2009. ^ Fleming, Mike (September 30, 2009). "Clooney film 'Air' gets release date". Variety. Retrieved September 30, 2009. ^ DiOrio, Carl (September 28, 2009). "'Up in the Air' shifted to Dec. 4: Overlapped with 'Men Who Stare at Goats' release". The Hollywood Reporter. Archived from the original on October 4, 2009. Retrieved September 29, 2009. ^ "Release Schedule: December 4, 2009". Box Office Mojo. Archived from the original on 2012-10-24. Retrieved December 5, 2009. ^ DiOrio, Carl (December 10, 2009). "'Princess' poised to reign at box office". The Hollywood Reporter. Archived from the original on December 16, 2009. Retrieved December 10, 2009. ^ "'Up in the Air' Official Website". Paramount Pictures. Archived from the original on January 7, 2010. Retrieved December 16, 2009. ^ "Up in the Air: Global Sites & Release Dates". Paramount. Archived from the original on September 12, 2009. Retrieved September 5, 2009. ^ Reitman, Jason (September 6, 2009). "Twitter Account: Jason Reitman". Jason Reitman. Archived from the original on 2009-09-21. Retrieved September 6, 2009. ^ Tapley, Kristopher (September 5, 2009). "Celebrating Cinema as an Art, Telluride Unveils '09 Fest". In Contention. Archived from the original on 2009-09-05. Retrieved September 5, 2009. ^ Reitman, Jason (September 4, 2009). "Twitter Picture Account: Jason Reitman". Jason Reitman. Archived from the original on 2009-08-29. Retrieved September 5, 2009. ^ Thompson, Anne (September 5, 2009). "Telluride Watch: Up in the Air Will Fly". Indiewire. Archived from the original on September 9, 2009. Retrieved September 6, 2009. ^ "New Clooney comedy to premiere at TIFF". Toronto Star. July 30, 2009. Archived from the original on 2009-08-01. Retrieved July 30, 2009. ^ "Toronto Film Festival adds latest from Reitman, Jeunet, Morgan". Canadian Broadcasting Corporation. July 30, 2009. Archived from the original on 2009-07-31. Retrieved July 30, 2009. ^ Tapley, Kristopher (September 11, 2009). "'Up in the Air' wowing press in Toronto". In Contention. Archived from the original on 2009-09-19. Retrieved September 12, 2009. ^ Karger, Dave (September 11, 2009). "Toronto: 'Up in the Air' plays for press". Entertainment Weekly. Archived from the original on January 22, 2013. Retrieved September 12, 2009. ^ Schoettle, Jane. "Films & Schedules: Up in the Air, Jason Reitman". Toronto International Film Festival. Archived from the original on September 16, 2009. Retrieved September 26, 2009. ^ Zeitchik, Steven (September 3, 2009). "With 'Up in the Air,' Jason Reitman tries another fall take-off". The Hollywood Reporter. Archived from the original on September 6, 2009. ^ Brevet, Brad (September 8, 2009). "First Clip from Reitman's 'Up In the Air' Debuts". Rope of Silicon. Archived from the original on 2009-09-11. Retrieved September 8, 2009. ^ Williams, Joe (August 13, 2009). "Countdown to your close-up: See "Up in the Air" trailer Sept. 10". St. Louis Post-Dispatch. Archived from the original on August 16, 2009. Retrieved August 13, 2009. ^ Brevet, Brad (October 1, 2009). "A Second Trailer for Reitman's 'Up In the Air': Now boarding a second trip to the friendly skies". Rope of Silicon. Archived from the original on 2009-10-05. Retrieved October 3, 2009. ^ Billington, Alex (October 2, 2009). "Must Watch: Jason Reitman's Up in the Air Theatrical Trailer". First Showing. Archived from the original on 2009-10-04. Retrieved October 3, 2009. ^ Oksenhorn, Stewart (October 1, 2009). "Director Jason Reitman gives Aspen spot in the credits". The Aspen Times. Archived from the original on October 5, 2009. Retrieved October 1, 2009. ^ "Film Guide '09 At-A-Glance". Aspen Filmfest. September 28, 2009. Archived from the original on September 12, 2009. Retrieved October 1, 2009. ^ "Official Website". Woodstock Film Festival. Archived from the original on 2009-08-15. Retrieved September 23, 2009. ^ "2009 Schedule" (PDF). Woodstock Film Festival. Archived (PDF) from the original on 2009-11-28. Retrieved September 23, 2009. ^ Brooks, Brian (September 28, 2009). "Reitman's "Up in the Air" and More Added to Hamptons Fest". Indiewire. Archived from the original on 2011-06-04. Retrieved September 29, 2009. ^ "Up in the Air". British Film Institute. Archived from the original on September 14, 2009. Retrieved September 23, 2009. ^ "Lunch date with Mr. Best Director?". Orlando Sentinel. October 27, 2009. Archived from the original on October 20, 2012. Retrieved October 29, 2009. ^ Hamilton, Keegan (October 28, 2009). "Shhh! It's A Sneak Peek of Up In the Air". Riverfront Times. Archived from the original on 2009-10-31. Retrieved October 28, 2009. ^ "Opening and Closing Night Films Announced!". Austin Film Festival. September 28, 2009. Archived from the original on September 19, 2009. Retrieved September 29, 2009. ^ "Events Special Member Screenings". Palm Springs International Film Society. Archived from the original on 2009-02-07. Retrieved October 10, 2009. ^ Gaffney, Adrienne (November 6, 2009). "Up in the Air Screening Has New York Elites Pondering Layoffs". Vanity Fair. Archived from the original on November 10, 2009. Retrieved November 6, 2009. ^ Guerrasio, Jason (November 6, 2009). "Filmmaker/Apple Presents Meet the Filmmaker: Jason Reitman". Filmmaker Magazine. Archived from the original on November 11, 2009. Retrieved November 6, 2009. ^ ""Up in the Air (Screening)" – Nov 8th". Boston Sunday Night Film Club. Archived from the original on 2010-03-13. Retrieved November 4, 2009. ^ Sells, George (November 14, 2009). "Clooney Film "Up in the Air" Makes St. Louis Debut". KTVI. Archived from the original on 2011-07-18. Retrieved November 14, 2009. ^ Stone, Sasha (November 14, 2009). "Up in the Air Literally". AwardsDaily. Archived from the original on 2009-11-19. Retrieved November 14, 2009. ^ Ellwood, Gregory (November 15, 2009). "20,000 ft. 'Up in the Air' with 'New Moon's' Anna Kendrick". Hit Fix. Archived from the original on 2009-11-17. Retrieved November 15, 2009. ^ Waxman, Sharon (November 15, 2009). "A Paramount-American Airlines Junket, Up In the Air". The Wrap. Archived from the original on 2009-11-19. Retrieved November 15, 2009. ^ Countess, Jemal (November 16, 2009). "'Up in the Air' Screening with Vera Farmiga and Anna Kendrick". Backstage. Archived from the original on 2009-11-19. Retrieved November 23, 2009. ^ "'Up in the Air' gets DVD release date". UPI. February 17, 2010. Archived from the original on 2010-04-30. Retrieved February 23, 2010. ^ "Up in the Air - DVD Sales". The Numbers. Archived from the original on 2011-09-03. Retrieved July 23, 2011. ^ "Weekend Box Office: 'Up in the Air'". Box Office Mojo. Archived from the original on 2014-04-06. Retrieved December 20, 2009. ^ "The Top Movies, Weekend of December 18, 2009". The Numbers. December 22, 2009. Archived from the original on 2011-09-04. Retrieved July 23, 2011. ^ a b McCarthy, Todd (September 6, 2009). "Up in the Air". Variety. Retrieved September 6, 2009. ^ a b "Up in the Air (2009)". Rotten Tomatoes. Archived from the original on 2010-06-23. Retrieved June 11, 2010. ^ Fernandez, Jay A. (September 7, 2009). "Optimism in 'Air' as Telluride ends". The Hollywood Reporter. Archived from the original on September 11, 2009. Retrieved September 7, 2009. ^ "Up in the Air: Reviews (2009)". Metacritic. Archived from the original on 2012-06-17. Retrieved January 24, 2010. ^ McCarthy, Todd (September 7, 2009). "Telluride rides out tough time". Variety. Retrieved September 7, 2009. ^ Stone, Sasha (September 22, 2009). "Indiewire Poll Names A Serious Man Best Film of TIFF". Awards Daily. Archived from the original on 2009-09-26. Retrieved September 23, 2009. ^ Turan, Kenneth (December 4, 2009). "'Up in the Air'". Los Angeles Times. Archived from the original on December 8, 2009. Retrieved January 14, 2010. ^ Gleiberman, Owen (December 30, 2009). "Up in the Air (2009)". Entertainment Weekly. Archived from the original on 2010-01-16. Retrieved January 14, 2010. ^ Puig, Claudia (December 4, 2009). "Timely 'Up in the Air' rises to challenge with humor, heart". USA Today. Archived from the original on 2009-12-08. Retrieved January 14, 2010. ^ Saito, Stephen (September 12, 2009). "Toronto 2009: "Up in the Air" Flies High". IFC. Archived from the original on September 15, 2009. Retrieved September 13, 2009. ^ Romney, Jonathan (January 17, 2010). "Up In The Air, Jason Reitman, 109 Mins". IFC. London. Archived from the original on 2010-01-19. Retrieved January 17, 2010. ^ Ebert, Roger (December 2, 2009). "Up in the Air". Chicago Sun-Times. Archived from the original on 2010-04-19. Retrieved October 13, 2010. ^ Dargis, Manohla (December 4, 2009). "Neither Here Nor There". The New York Times. Archived from the original on 2010-02-08. Retrieved January 14, 2010. ^ Phillips, Michael (September 11, 2009). "Toronto fest: "A Serious Man," and a shallow one". Chicago Tribune. Archived from the original on 2009-09-23. Retrieved September 12, 2009. ^ Sancton, Julian (September 22, 2009). "Is Up In The Air Rising on Hot Air?". Vanity Fair. Archived from the original on September 26, 2009. Retrieved September 28, 2009. ^ Hoberman, J. (December 1, 2009). "George Clooney in Up in the Air: Getting fired sux, but Jason Reitman says u will b OK l8r". The Village Voice. Archived from the original on 2010-01-24. Retrieved January 14, 2010. ^ Jake Tomlinson (December 10, 2009). "Movie Review: Up in the Air". Archived from the original on 2011-07-16. Retrieved December 23, 2009. ^ Reynolds, Simon (March 7, 2010). "In Full: Oscars 2010 – The Winners". Digital Spy. Hachette Filipacchi (UK) Ltd. Archived from the original on 2010-06-20. Retrieved July 17, 2010. ^ "Nominees & Winners for the 82nd Academy Awards". Academy of Motion Picture Arts and Sciences. Archived from the original on April 19, 2010. Retrieved July 17, 2010. ^ "BAFTA Winners 2010". British Academy Film Awards. British Academy of Film and Television Arts. January 21, 2010. Archived from the original on January 9, 2012. Retrieved July 17, 2010. ^ "Dallas-Fort Worth Film Critics Name "Up in the Air" Best Picture of 2009" (PDF). Dallas-Fort Worth Film Critics Association. December 16, 2009. Archived from the original (PDF) on 2011-07-09. Retrieved May 1, 2010. ^ Wilonsky, Robert (December 16, 2009). "DFW Crix Up in the Air With Year-End Tally". Dallas Observer. Archived from the original on 2014-03-22. Retrieved December 16, 2009. ^ Ciarrocchi, Justine (January 17, 2010). "Golden Globes 2010: Christoph Waltz Wins for Best Supporting Actor". Screen Crave. uCrave. Archived from the original on July 26, 2011. Retrieved April 30, 2010. ^ "Golden Globes nominations: the 2010 list in full". The Guardian. London: Guardian News and Media Limited. December 15, 2009. Archived from the original on 2014-04-21. Retrieved January 31, 2010. ^ "Writers Guild Awards-Previous nominees and winners". Writers Guild of America. Archived from the original on March 28, 2016. Retrieved May 16, 2015. ^ "2009 14th Annual Satellite Awards". International Press Academy. Archived from the original on September 28, 2010. Retrieved April 30, 2010. ^ Ditzian, Eric (December 17, 2009). "SAG Awards Nominations Led By 'Up In The Air,'Precious'". MTV. Retrieved December 17, 2009. ^ Esmailian, Ani (December 17, 2009). "2010 Screen Actors Guild Awards Nominations List". Hollyscoop. DNA Group, Inc. Archived from the original on January 29, 2010. Retrieved August 1, 2010. ^ "2010 MTV Movie Awards Winners". MTV.com. MTV Networks. Archived from the original on 2010-06-08. Retrieved May 15, 2010. ^ Serpe, Gina (January 6, 2010). "Mariah's Acceptance Speech More Lush-ious Than Precious?". E!. Comcast. Retrieved May 4, 2010. ^ Moore, Roger (December 21, 2009). "Florida Critics Circle joins the Up in the Air bandwagon". Orlando Sentinel. Tribune Company. Archived from the original on December 23, 2009. Retrieved December 22, 2009. ^ Pond, Steve (January 15, 2010). "Good Morning, Oscar: January 15". The Wrap. Archived from the original on 2012-04-01. Retrieved August 1, 2010. ^ Robinson, Anna (December 14, 2009). "2009 Southeastern Film Critics Association winners". Alt Film Guide. Archived from the original on 2012-04-06. Retrieved January 31, 2010. ^ Robinson, Anna (January 4, 2010). "Up In The Air, Meryl Streep, Colin Firth: Vancouver Film Critics Nominations". Alt Film Guide. Archived from the original on 2012-03-25. Retrieved May 7, 2010. ^ "The 15th Annual Critics' Choice Awards". Broadcast Film Critics Association. Archived from the original on October 17, 2010. Retrieved July 17, 2010. ^ ""The Hurt Locker" Takes Top Honors". Chicago Film Critics Association. December 21, 2009. Archived from the original on 2012-03-06. Retrieved July 17, 2010. ^ "The 8th Annual Central Ohio Film Critics Association Awards". Central Ohio Film Critics Association. January 7, 2010. Archived from the original on 2010-01-26. Retrieved January 9, 2010. ^ "Denver Film Critics Society 2009–2010 Award Winners". Denver Film Critics Society. January 27, 2010. Archived from the original on March 18, 2012. Retrieved July 17, 2010. ^ "Up in the Air Flies High with D.C. Film Critics". Washington DC Area Film Critics Association. December 7, 2009. Archived from the original on 2017-03-12. Retrieved April 30, 2010. ^ "Kansas City Film Critics Circle". Kansas City Film Critics Circle. Archived from the original on 2010-05-25. Retrieved May 5, 2010. ^ "2009 National Board of Review Awards". National Board of Review. Archived from the original on June 12, 2010. Retrieved December 3, 2009. ^ "12th Annual Costume Designers Guild Awards". Costume Designers Guild. January 26, 2010. Archived from the original on 2012-03-27. Retrieved January 26, 2010. ^ Ebert, Roger (December 19, 2009). "Roger Ebert's Journal: The best films of 2009". Chicago Sun Times. Chicago, Illinois: Sun-Times Media Group. Archived from the original on August 10, 2010. Retrieved July 28, 2010. ^ Holden, Stephen (December 18, 2009). "Long Shadows of an Economy and a War". The New York Times. The New York Times Company. Archived from the original on 2014-03-16. Retrieved July 25, 2010. ^ Silverman, Stephen (December 14, 2009). "AFI Honors Hangover, Mad Men and Hurt Locker". People. Time Warner. Archived from the original on 2012-10-13. Retrieved July 25, 2010.